Japanese unryu paper, acid-burned velvet, "found" book pages, silk and part of a kitchen appliance — those are among the materials that Burlington artist Catherine Hall uses to create the works on view in "Paper Pieces & Works on Paper." 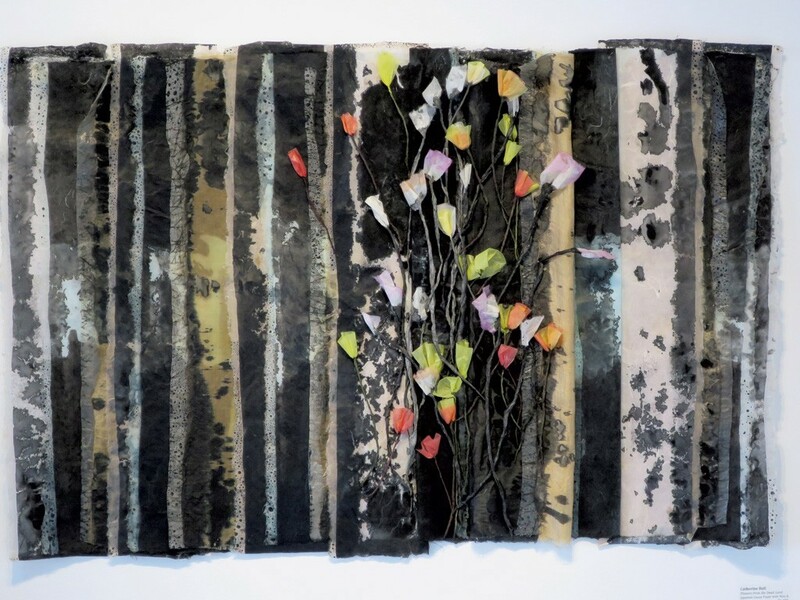 As its title suggests, this latest show at the SEABA Center on Pine Street focuses on one particular material within Hall's prolific body of work, which spans oil and encaustic painting, sculpture, printmaking and paper works. "When I want a little break," Hall said, "I switch from one thing to the other." "Paper Pieces" is a small selection, curated by Hall herself, including four paper works — three of which are three-dimensional — and approximately 20 smaller prints. 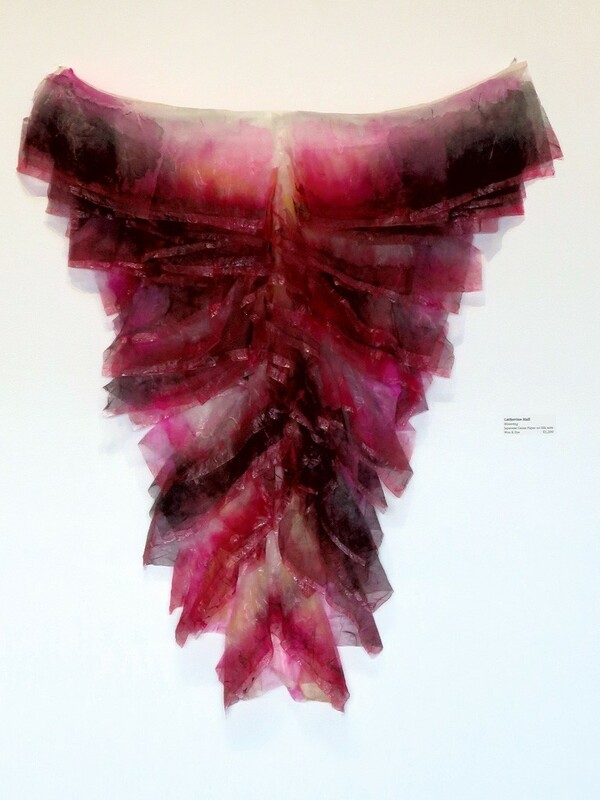 "Hovering" is perhaps the most striking of the group; this hanging wall sculpture is made from hundreds of textile-like sheets of paper hand-dyed in rich shades of magenta. The artist's interest in such forms dates back to childhood stints at her family's textile mill in Manchester, England. Hall's Queen City roots go deep. She cofounded the Vermont chapter of the Women's Caucus for Art, an organization that would later become Art's Alive; she helped to establish the artist-run cooperative gallery 215 College and run it from 2005 to 2011. 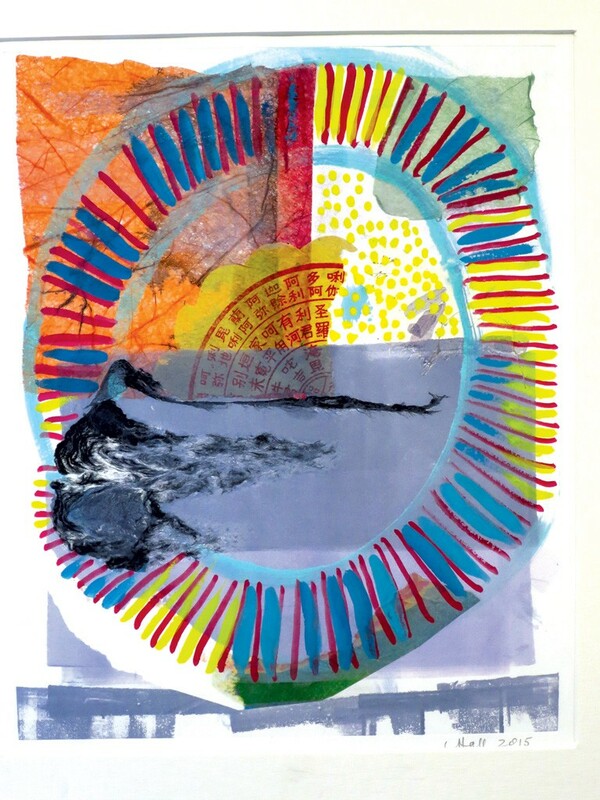 Currently, besides the SEABA show, Hall has works on view at the Innovation Center of Vermont (which, incidentally, was once a textile mill) and a permanent installation at the Fletcher Free Library. 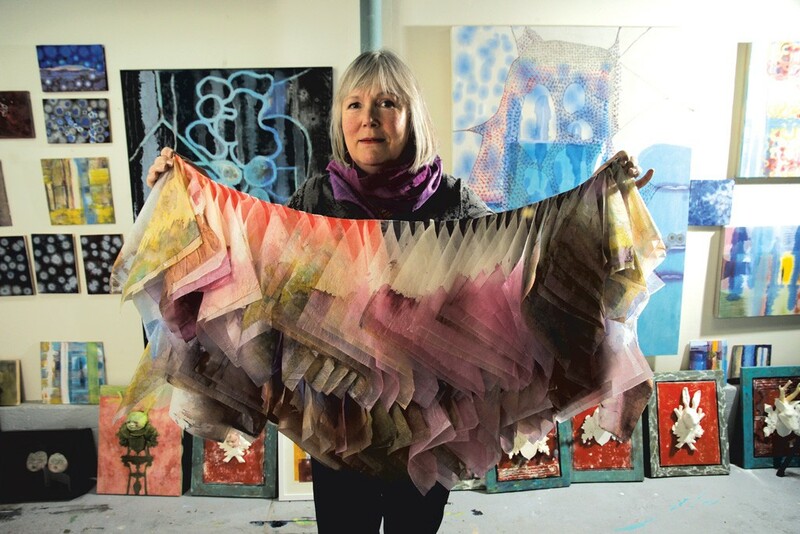 Next month, Hall will exhibit with five other artists, including her daughter, Meg Lipke, in the New City Galerie show "In a Field With No Bounds." Over coffee, the artist talked more about her work and processes. What are the origins of your paper works? Three-dimensional paper pieces are something I've been working with for a long time. [Paper works] are how I started making art again, after coming to the States to study art history and having small children. It felt most comfortable to deal with. Dye, fibers — I did batik, too. It was something that could be done in steps. You could have interruptions; it didn't matter — you could assemble the work over time. I set [those works] aside for years. It was hard to sell them because they look so delicate. But as the one at the library [hung in 1981] proves, if they're looked after, the paper is very strong. In 2012, I was invited to be in a fibers show at Creative Space [Gallery] in Vergennes. I thought, Paper is not what people would expect — it's not sewing or embroidery or quilting. So I put [a piece] in that show and thought, I better make some more of those. Can you talk about your father's textile mill? This was a textile mill that was established in the 1860s by my late great-grandfather. When I was a child, it was doing well. My father would take us during holidays to do odd jobs in the mill, starting out with very simple things like sorting bobbins. By the time I was maybe 16, I was working at the ends of the winding machines. It was a mill that had mostly machinery, a cotton mill rather than a woolen mill, which is what we have in Vermont, but similar. It had a dye house, which was not a house: It was a big space with a huge chimney. They used to lower great hanks of yarn into vats of dye and lift them up again. It was just great to see it happening. How do you account for the vast breadth of your work? I think a lot of it came out of teaching, [particularly] being the one full-time person teaching at a small college, Trinity. I taught everything, so I learned how to do things that I wasn't even familiar with, because it connected to the history of art. When you talk about engraving and etching, you want the students to know what those are — so we did them. I taught a sculpture course at [the University of Vermont] after Trinity closed, as a replacement for an artist who had left on sabbatical. I thought it was going to be just a general intro to sculpture, but, just before the term began, the chair told me it was actually modeling and casting. I hadn't done any casting since I was in art school, when I was about 17. It was quite a challenge to teach it, but after that I just loved casting. So I started making the small cast faces, some of which turned into the "Hunting Lodge" trophies [a series of mounted sculptural human and animal heads first exhibited in 2014]. What is a commonality shared by your works in different mediums? Wax is used in at least two of them. Texture is really important to me. Working with color. Experimentation. All of them are things that I experimented with, and came up with something that was really interesting to me. I've set aside the plastic casting. The most recent thing I did was small paintings, some of which will be in the show next month at New City Galeri e. Because I hung all those prints [at SEABA], I thought it'd be fun to go back to printing — I have a small press in my studio. As someone who's been part of the Burlington community for decades, do you have any observations on how the art scene has changed? I think it's getting to be much more exciting than it was 20 years ago, or even 10 years ago. There are a lot more artists, young artists. It's great to have new galleries and new things popping up. It's great to have the New City Galerie across from Burlington City Arts. I think much more is happening. It would be nice if there were more collectors, more buyers. I always hope that we'll develop as more is happening. Maybe more people here in Vermont will buy works by Vermont artists that aren't necessarily landscapes. Last week, Burlington arts organizations South End Arts and Business Association and Art's Alive announced their merger. That cedes the duties of the nonprofit Art's Alive — curating the gallery spaces owned by Main Street Landing and hosting the annual summer Festival of Fine Art — to SEABA. Alex Dostie of Dostie Bros. Frame Shop has been executive director of Art's Alive since 2011. SEABA executive director Adam Brooks explained to Seven Days, "As [Dostie's] business has grown, we started talking with him and the folks at Art's Alive about making the transition. SEABA has a lot of the infrastructure: We have a curator; we do the [South End] Art Hop; we have a great board of directors. It just seemed like a logical next step." SEABA associate director and curator Sarah Drexler will step up to become executive director of Art's Alive, a position in which she will oversee organizational marketing and curate the gallery spaces at Lake and College, Union Station and the Wing Building. She'll also run June's Festival of Fine Art, a juried event that places local artwork in Church Street store windows. "We are looking at ways to create more of a festival feel and get more people involved," noted Brooks. He also asserted that Art's Alive will remain its own branch of SEABA. "We really believe in the brand; we think it's a strong brand that has good potential," Brooks said, "and we want to honor all the hard work that was put into Art's Alive over the last 30 years." The original print version of this article was headlined "Paper Works"